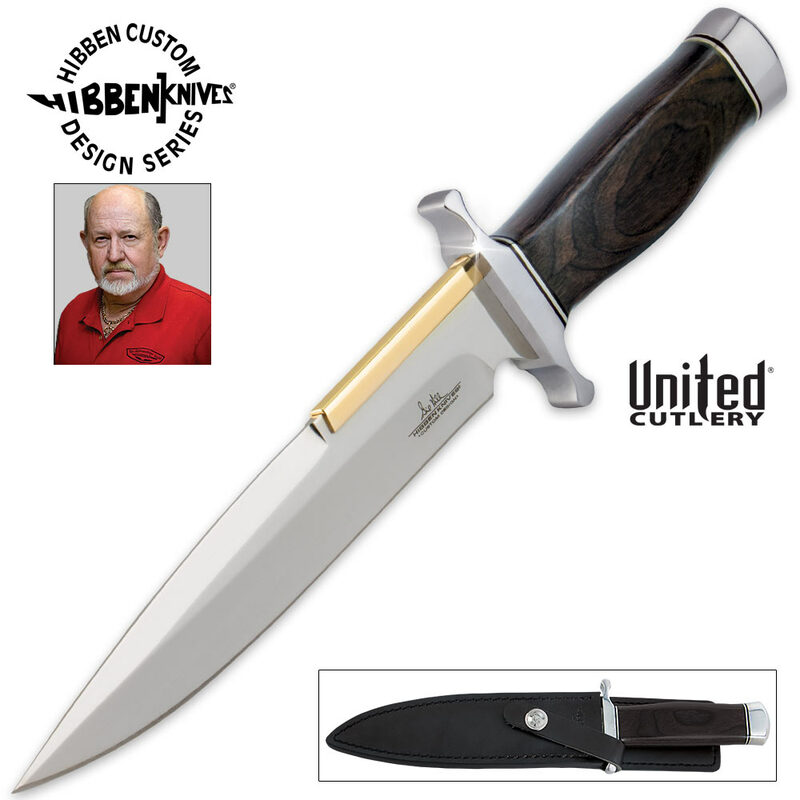 The Latest edition in the Hibben IV knife series. 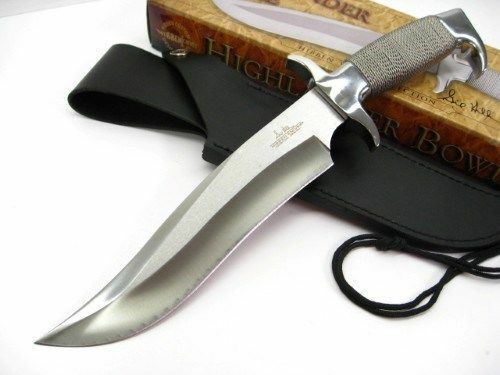 This knife offers a machete style blade constructed from 440 stainless steel. The solid hardwood handle is surrounded by the stainless steel guard and pommel. Includes custom top grain leather sheath. 16 1/2" overall. 11 1/4" blade. enowned knifemaker Gil Hibben has been designing and producing top quality edged collectibles for more than 50 years. His son, Wesley, has been making and designing custom knives for more than 25 years. 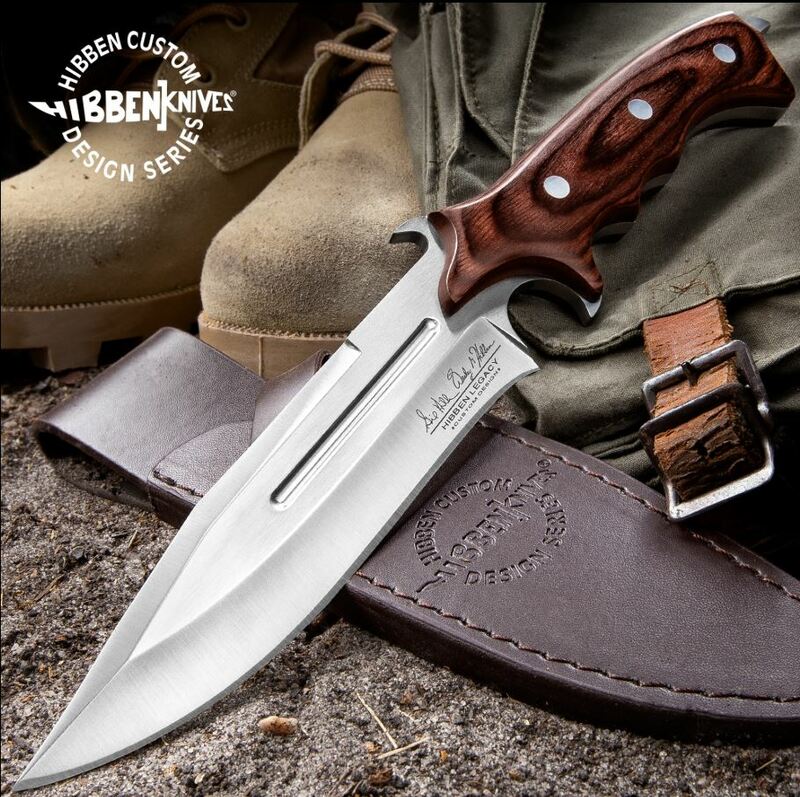 For the first time ever, Gil and Wes teamed up to create a priceless collectible - The Hibben Legacy Combat Fighter. Now, United Cutlery and the Hibbens present it with a rich, brown pakkawood handle. The blade is a razor-sharp, 5 7/8" 7Cr17 stainless steel and has a stinging spear point tip and extended piercing tang. The polished brown pakkawood handle scales wrap the full tang blade for a stylish, smooth grip. A raised thumb rest on the back of the blade and a trigger-finger grip allows for excellent control when wielding this knife. Each blade is laser serialized and etched with Gil and Wesley Hibben’s signatures. The Legacy Combat Fighter II comes in a custom leather sheath stamped with the "Hibben Knives Custom Design Series" logo. This unique collectible should be passed down for future generations to enjoy. 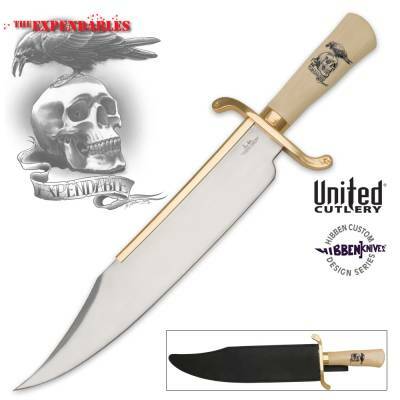 15" overall, a 10" razor-sharp AUS-6 stainless steel blade with powerful sawback teeth. The micarta handle offers a solid, ergonomic grip as the polished hand guard protects your hand from slipping to the blade. Lashing holes are pre-drilled in the guard and pommel to allow for spear making by lashing the knife to a long, wooden handle. Includes a custom leather belt sheath with the Hibben Custom Design logo stamped right into the leather and certificate of authenticity. Gil Hibben reinterprets his famous "Old West" knife in the form of this brand new Hibben "Old West" Boot Knife. This 10.6" overall, fixed blade knife features a 6 1/2" high-polished, sharpened, stainless steel blade with a brass spine plate. The attractive hardwood handle provides an elegant finish with an Old West feel. A leather boot clip sheath is included. 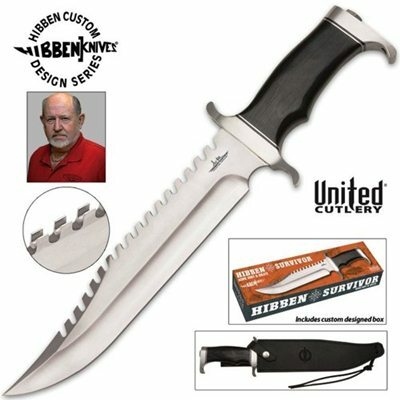 The latest from The Hibben range of custom knives, this time he's mastered the tanto with this extremely well made creation. 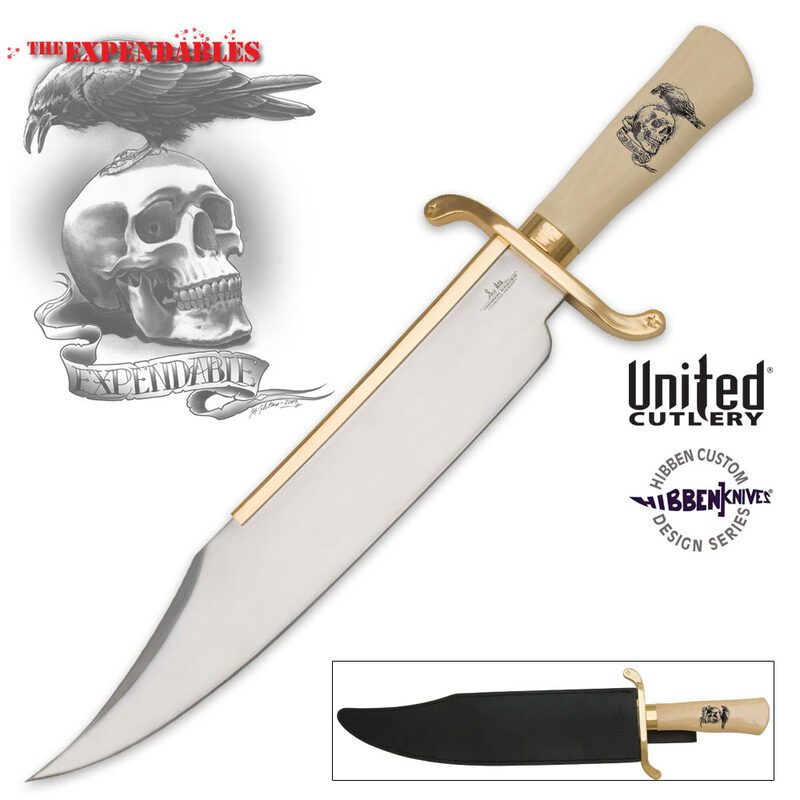 Official Hibben Expendables Legionnaire Bowie. 14 3/4" overall. 9 1/2" 7Cr17 sharpened, stainless mirror polished blade. Black micarta handle with mirror finished guard and pommel. Leather belt sheath. Officially licensed reproduction of the actual film prop used in the movie Expendables�. This classic stainless masterpiece was designed with the ancient highlanders in mind. In 1988 Sylvester Stallone made the third Rambo movie. As a knife collector, Stallone had a number of Gil Hibben's knives in his personal collection. 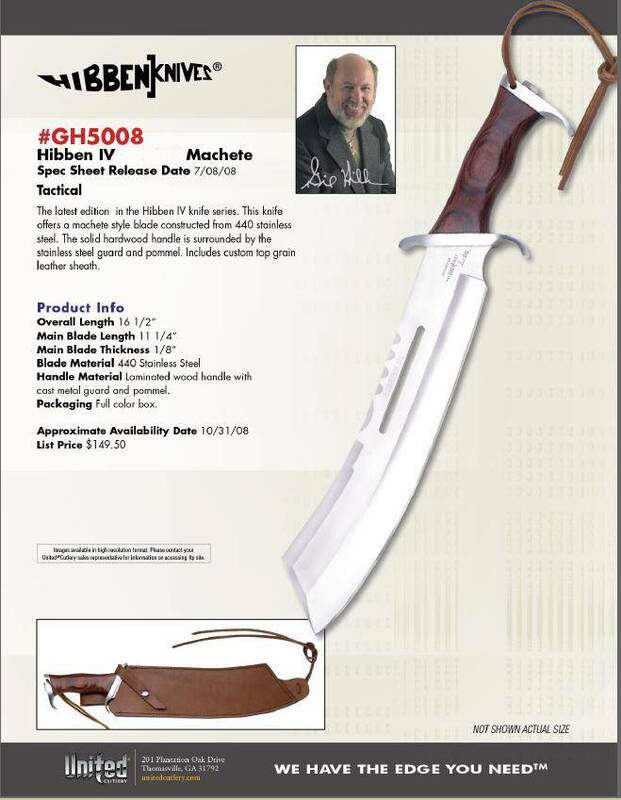 So when he needed a bold new knife design for his John Rambo character in the movie, he called on Gil. After some ideas were passed back and forth between Stallone and Gil, they settled on the now famous modified bowie design which is the Hibben III bowie knife.